(Last Updated 31.10.18). 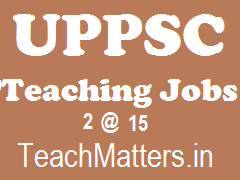 Uttar Pradesh Public Service Commission (UPPSC) had invited online applications for recruitment to various teaching posts in various departments of Uttar Pradesh Government. Eligible and interested candidates could apply online through official website of UPPSC i.e. www.uppsc.up.nic.in as per the schedule. SOCIAL WELFARE DEPARTMENT, U. P.
Candidates can apply through official website of UPPSC i.e. www.uppsc.up.nic.in on or before 14.04.2015. No other mode of application will be accepted. Note : For other details regarding eligibility criteria, minimum qualifications, age-limit, selection process etc., download original advertisement here or visit the Commission's website - www.uppsc.up.nic.in.